I couldn't tell the story of my favourite dessert from my paternal grandmother, without talking about my favourite comfort food from my maternal grandmother, Baba. 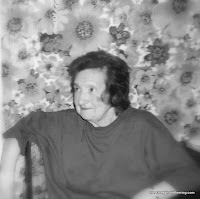 From the time my grandmother retired, she would visit pretty much every weekend, and whenever I was sick. Sometimes, I'd be whisked to her place when my parents were on the way to work and I was too sick to go to school. 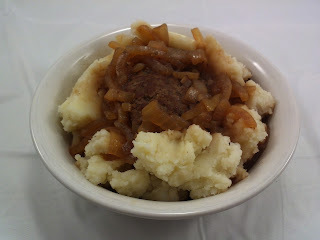 If I was able to keep food down, more than likely, I was getting burgers with onions and mashed potatoes. It still is my favourite comfort food. I usually stayed in the kitchen when she was making it, so when I was older, it was me who made it for her. but for this, I make an exception. The most interesting part of the dish is how she made the potatoes. My grandmother wasn't kosher, however, she didn't really mix milk with meat. Well, no milk makes making creamy potatoes very difficult. Instead, Baba whisked a raw egg and a bit of water together and added it to the potatoes. I worked pretty well, when the alternative was using some non-dairy creamer. In November, I caught a nasy cold for the second time in six weeks, and Meredith was sick as well. It's very difficult when we're both sick. Normally, my mom would come rushing over with enough food to feed us for a week (hey, she enjoys it, so why should we fight it?). However, my parents were out of town, so we were on our own for food. The past few days had been packaged soups, toast, and soft boiled eggs. I needed something more, and I thought of my grandmother's burgers. Place the potatoes in a medium pot and fill until the water is about one-inch above the potatoes. Add salt and bring to a boil. Let boil, uncovered for around 30 minutes, until potatoes are soft and break apart easily. Add oil to a deep pan and heat on medium. Add onions and let simmer, stirring frequently, until onions are soft and begin to brown. 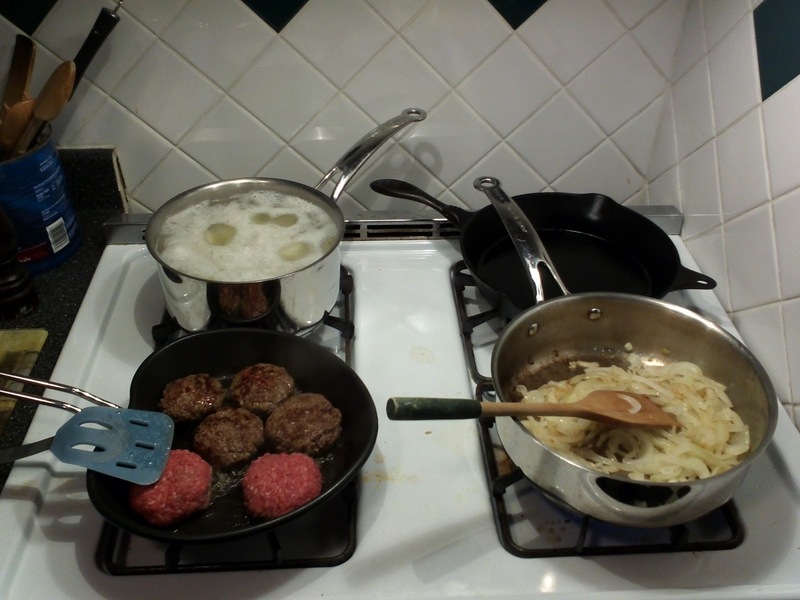 Divide the beef into six equal parts and form into patties about 1/2-inch thick. Heat a non-stick pan on medium and fry the patties for 2-4 minutes per side, until nicely browned. Add the beef stock to the onions and heat on high until boiling. While continuing to boil the broth mixture, add the patties. Let mixture boil for around 30 minutes, until broth is reduced. When potatoes are ready, crack the egg into a small bowl, add 1 tbsp water and gently mix with a fork. Drain the water from the potatoes, add margarine, and quickly mash roughly with a potato masher. Add egg mixture and continue to mash. Add pepper to taste. Serve in a bowl by making a well in a pile of potatoes and placing a burger, onions and some broth in the middle. Ooh, that looks so lovely and comforting! Though what is the fourth pan for? My housemate always makes burgers so I will have to point her to this recipe the next time I feel ill! Love comfort food like this and nice story about your grandmother. This recipe reminds me of salsbury steaks I used to eat as a kid. Happy New year! @Jenny: the fourth pan is my largest cast iron. It lives on the cooker because we use it so often. It only leaves when it's in the way. My grandmother made the best mashed potatoes ever---with lots of butter, milk, and lots and lots of black pepper! This made me remember those Sunday suppers at her house with all of the cousins around. I love food that brings back memories. Hope you have a wonderful 2012!